The 2018 law school enrollment figures have been released. They show a slightly improved picture in JD enrollment and continued soaring growth in non-JD enrollment. About 14% of law school enrollees, 1 in 7, are not enrolled in a JD program. 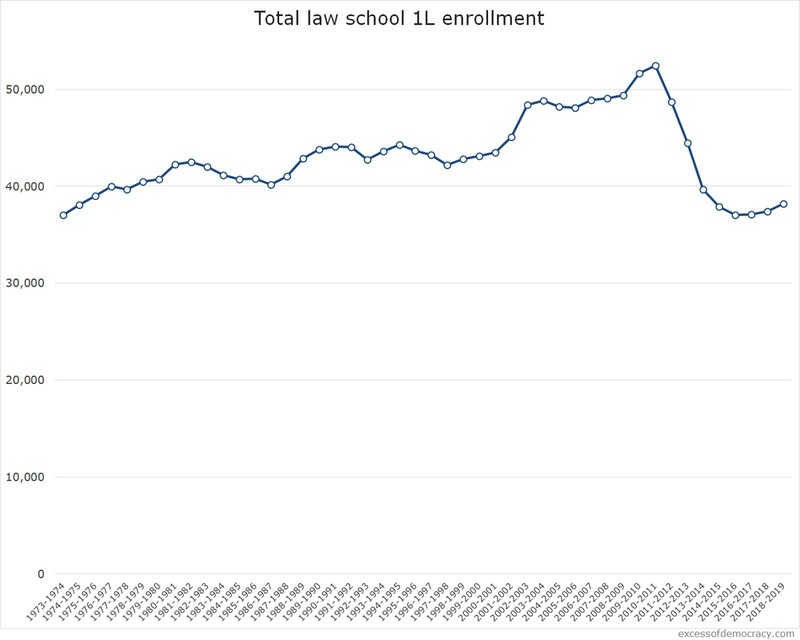 This is the fourth consecutive year of growth in the incoming 1L class, but a bit larger than the last few years’ growth: there were 38,390 new 1L enrollees, about 900 more students over the incoming class in 2017. It’s the largest 1L class since 2013’s 39,675. (The 2010 peak was 52,488 1Ls.) This is despite the fact that two schools—Valparaiso and Whittier—admitted zero first-year students. Despite much heralded promises of a “Trump bump” in law school enrollment, my earlier posts on the subject proved true: a modest increase in 1L enrollment of 2.6%, as I projected in December 2017, despite 19% increases in LSAT test-takers (because many were repeaters, not all translate into applicants let alone enrollees, and quality of scores matters) and despite 8% applicant spikes. Part of it reflects some of the concerns I raised earlier, but it appears most schools were more cautious this cycle, choosing to improve class quality (likely a good move given persistently low bar exam scores). 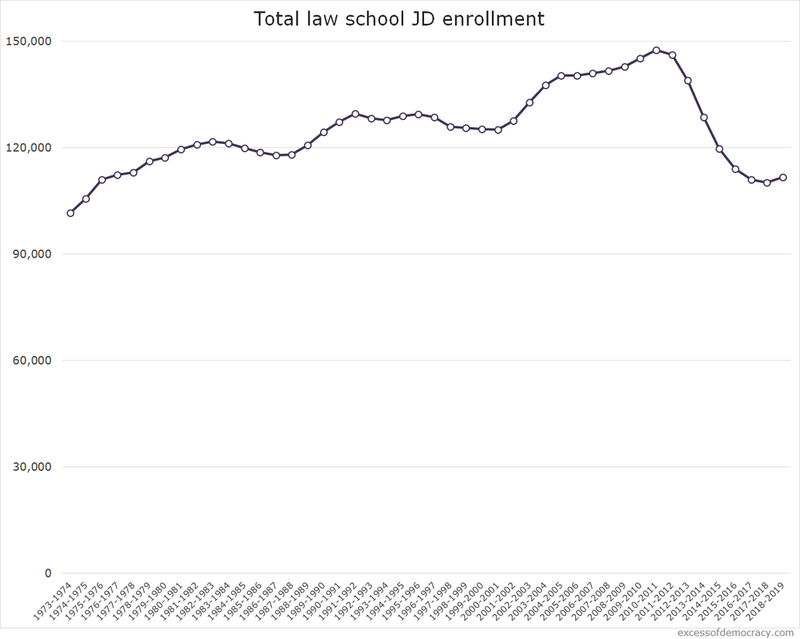 Total JD law school enrollment also ticked up slightly to 111,561 (still well off the peak of 2010-2011 with 147,525). Non-JD enrollment continues to climb. The ABA changed its definitions a couple of years ago, which resulted in a spike in reported non-JD enrollment, but the steady climb continues. 18,523 were enrolled in non-JD programs, a 1,400-student jump over last year. Now over 14% of all students enrolled in law school are not a part of a JD program, about 1 in 7 students. Growth in non-JD online enrollment as a part of overall non-JD enrollment continues, too, with much faster growth than when I first looked at trends two years ago. This is overall modestly good news for law schools. I continue to wonder about the sustainability and value proposition of non-JD legal education, but perhaps my concerns are overblown. That said, more information about the kinds of degrees and the outcomes of those who secure these degrees would be welcome information, if the kind that is unavailable at this time. Finally, we see some continued growth in LSAT test-takers again this cycle. We may see 1L enrollment creep up again, perhaps surpassing 40,000 students next year. For law schools, a robust and valuable JD program is essential, and that would be a good step toward restoring some of the losses suffered after the recession. 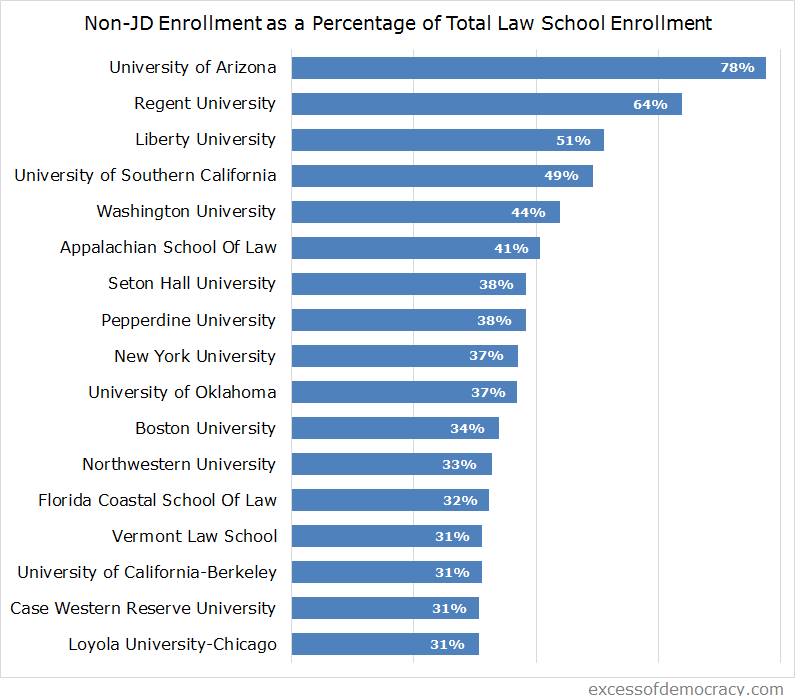 Below I highlight a handful of schools with the highest non-JD enrollment as a percentage of total law school enrollment.